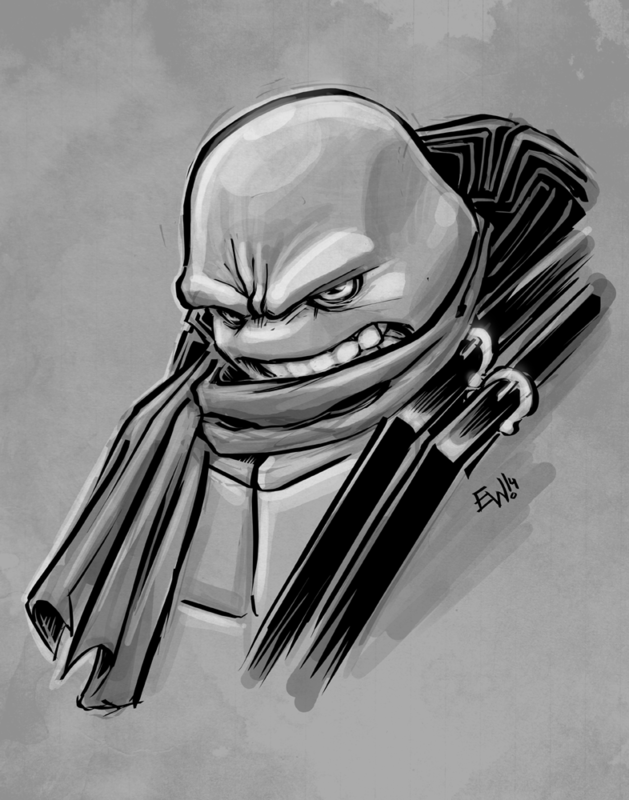 Warmup sketch in photoshop with brush tool on stylus-determined opacity and line size. Just a test image for tweaking my wacom pen settings a bit. Turns out any adjustment just throws off what I'm used to so stuck it back to normal. Good to go just how it was I suppose! 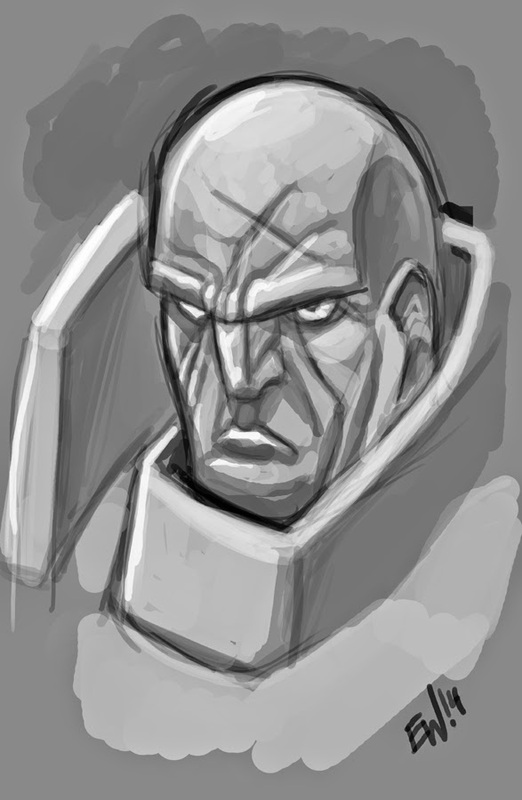 Sometime I'd like to do a finished piece in this chiseled/ sculpted painted look. But for now - dis mean-mugged fellow is all there is! Happy to show off the finished art of the 400 Likes giveaway! Due to my own hiccup I decided to go ahead and do two. Shown here are the two pieces, the third attempt to pick a winner and the previously picked (second attempt) (which contacted me under the deadline but I jumped the gun on the re-pick). Both turned in very similar requests. 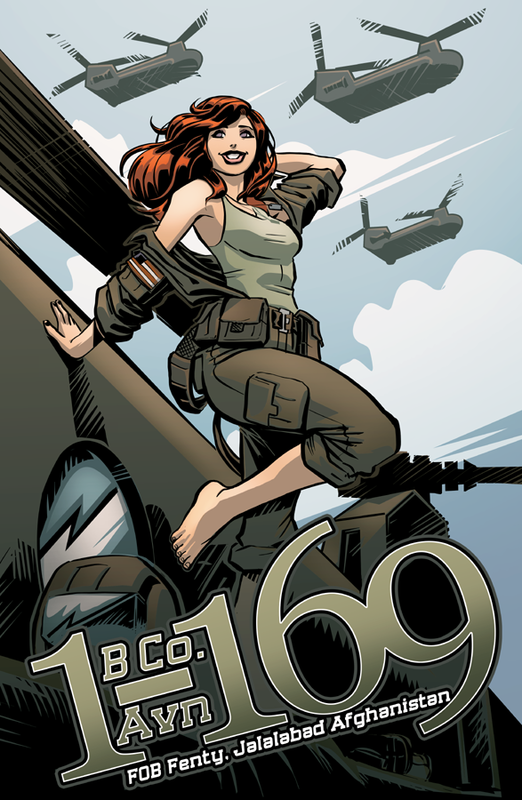 Their requests for their free commissions appealed to each of their occupations or interests but also both ended up requesting a pinup girl style piece. Both had to take a bit longer than I planned as they are free and come after paid work. 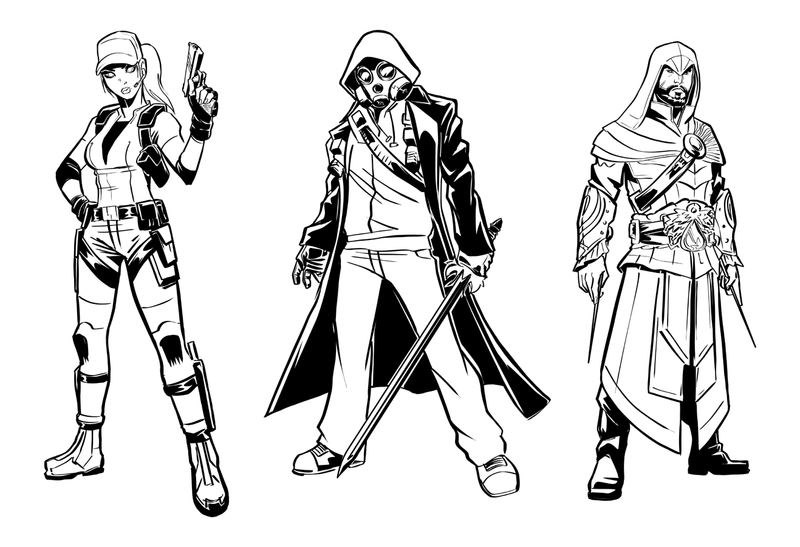 They were an absolute blast to work on. 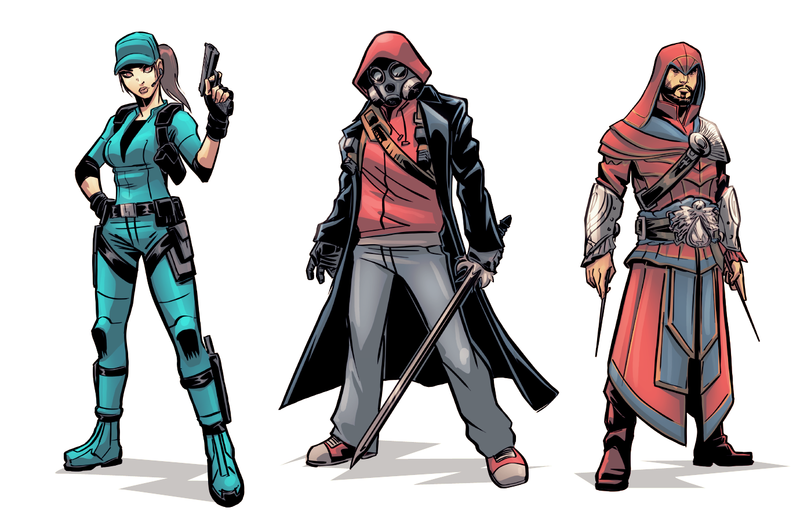 Both penciled in photosohp, inked in inkscape and colored in photoshop and are 300dpi 11x17inches. Enjoy this week's Jumping Boy installment, see you next wednesday for the next. The page isn't finished I know and I just did some quick loose inks. 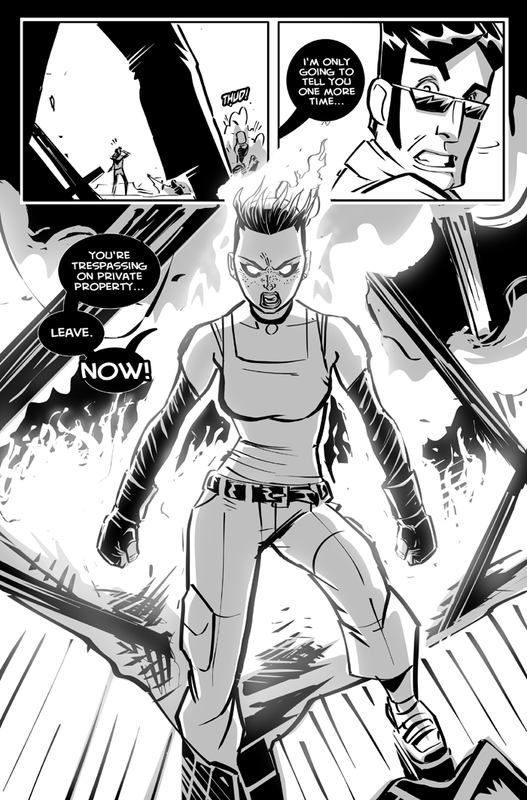 Will redraw/finish properly down the line when it is released in comic form but for now the story continues! And thats the main thing I want to keep going for now. Here is this morning's one character full color fanart commission of Thundercracker, one of Megatron's seekers from the original, the best G1 Transformers! Was fun, I did a SkyWarp and didn't want any chance of the client thinking I just repainted the previous character with this one's colors. So new/ different pose and everything. Was a lot of fun and one of my best transformers depictions yet. Completed in only an hour and a half - check out the video of this piece condensed into about six minutes and 30 seconds! Enjoy! Any questions about the process or techniques/ programs used please comment below I will answer asap! Fine tuning brush settings and saving some presets, which I haven't done till now, getting myself a ideal brush the way I like it, an ideal nib the way i like it and an ideal splotch brush. Thats why I enjoy inkscape for drawing/ inking so much because its so customizable and you can really adjust settings to make the brush line and the way it feels/ reacts to your movements as fine tuned as you want. 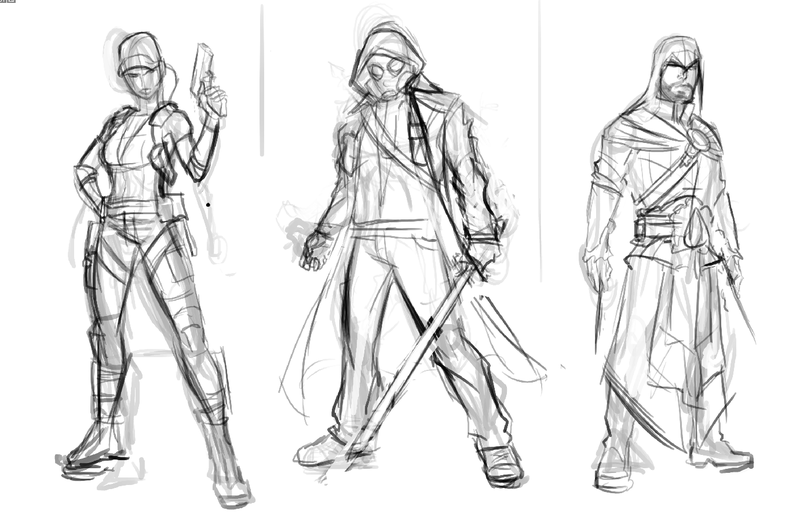 Pretty happy with the new settings... onto do some inking rest of the afternoon! Just thought I'd share my crazy lookin scratchin here! Hello! I'm happy to report this afternoon that all July MicroSale orders are now complete! I was shooting for last Friday and got them all done except for a 3 order purchase from NoMaD due to some unexpected in-flux of work but I'm happy to say all orders are now complete. Hope everyone loves them and thank you so much for participating in that 4 hour livestreamed micro sale back on july 31st! Did you miss it? There are sure to be live sketch request nights and slot commissions again in the future. So stay tuned to EWG websites for notice when those happen. 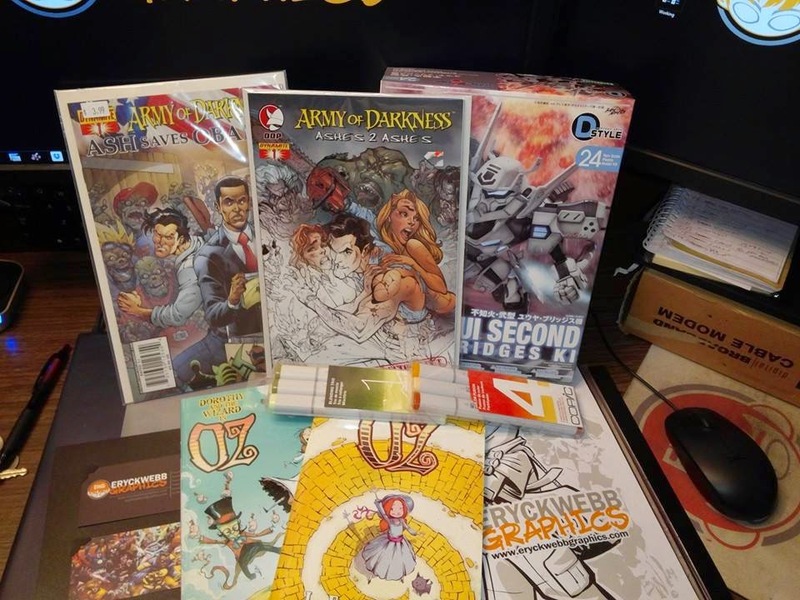 Place an order during the July Micro Sale and didn't get the finished art emailed to you? Its possible, but all are done so just let me know and I will get that over to you ASAP! But all SHOULD be sent at this point. I wanted to commemorate the end of the sale production by making a video of the process start to finish of these three pieces. From blank canvas to pencils, to inks to colors, you can watch the video below. Also, further down below that, is a jpg of each step along the way, even showing flats, highlights and so forth beneath the lineart for those who really enjoy studying that kind of stuff. So heres the video, and process breakdown, and thanks again to everyone who made this micro-sale a success! 3 hours of work condensed into about 11 minutes! Saved out images of the various steps! Colors halfway done on the Chinook Girl piece I'm doing for a special client based in Afghanistan right now. Showin some love for the Chinook pilots over there! I'm enjoying a limited palette and though the flat colors are sweet will be adding in shades etc for the finished piece. Alright, just a glimpse at whats cranking in the EWG mill today! So this is just a general notebook entry to say I will seem a bit quieter in coming weeks but that's just cause EWG is knuckling down and cranking on the mill. My client queue has gone from lots of character art commissions to a handful of big comic jobs and graphic jobs so I'm excited to have less to focus on and they're all bigger commission items so I will have some steady living funds for a while which is always great. Will still consider all potential new commission orders, just keep in mind smaller quick jobs will be more likely accepted right now than big ones. As always check the price-list for an item your interested and email me at eryckwebb3@yahoo.com for any quotes or job inquiries. Alright back to the mill! This TnC 1 Year Anniversary video is a commemorative look from around the end of production on the last sheet of strips from season 1. The only thing after the video I think was some texture and level adjustments and I went and made sure to tidy up the lettering alignment a little more before sending it out to Cory. The bottom strip, #52 was the last strip of season 1 and I wanted to capture the work on it with video for sure :) Only till now I didn't know how to edit for time and insert music that was acceptable on YouTube - I now have learned a bit how to do that. So enjoy the video, thanks for all the support to me and cory, I love the strip and working on it is truely a highlight of my career. The above video is about 2-3 hours of work (forget exactly) condensed into 8 minutes. Enjoy! 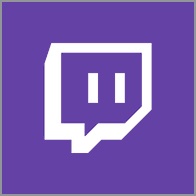 Finaly figured out how to import recorded livestream videos, and edit the speed and content - and also overlay non-copyright infringing music that youtube and other places won't complain about. Heres' my first attempt - all beat a bit pulse pounding o' music, I thought it fit the break dancing monk pretty well. Will have to learn little things like fading at the end and so forth over time, and will probably slow it down a bit more for future installments, but these will serve as great demos of my process, and for the different type of work I do so clients can see it in action, and also be a good way to sum up live sketch night and stream events that might be 3 hours long, i can condense it into about 5-10 minutes. 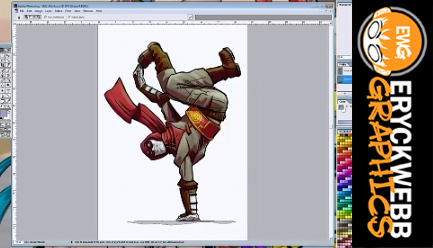 Enjoy the first proper installment of the EWG youtube channel, 'MC Monk Complete' - featuring a demonstration of an early 2013 single character no background commission of the client's Champions Online OC - a kung fu break dancin free running monky monk. Warmup sketch this morning after a new configuration of my wacom/ keyboard etc. Ran wires a different way for my mouse/ keyboard/ wacom so they weren't in the way of the keyboard etc, and stuck a couple things on the base of the monitor/desk so that the wacom/keyboard are tilted more. Its easier to reach things, tilting towards me instead of flat or away. Time will tell if this will improve the work. I believe I had this setup like this at one time months ago and it helped with my drawing but will see if thats true or not. Some hellboy action, experimenting, practicing, every day! And as a bonus here's lastnight Leo sketch i did before bedtime but without the gray shades - something about the raw black and white are pretty cool... anymore I often like the black and whites before I slap color on them or gray shades. Alright, onto the days work, one more day to knock stuff out this week. Have a great one! 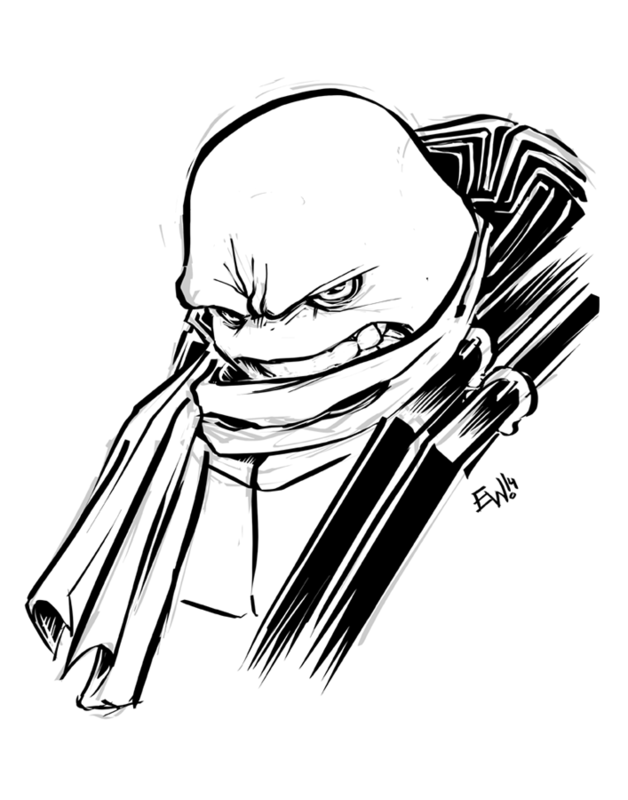 Cool down sketch of my fav turtle 'Leonardo' - not going for anything particular just had an itch to draw something before going to bed so did a quick head-sketch and let the varied brush pressures fly. I enjoy the fat blobby areas and then when it tapers to thinner lines. Then topped it off with black fills and then took it from inkscape over to Photoshop to add the gray shades and highlights and textures. Daz a wrap! Be sure to check out my current project with Nick over at Ultimate Teenage Mutant Ninja turtles for more on my visual take on the tmnt. Always a love letter to the turtles i grew up with in the comics, particularly A.C. Farley, Michael Dooney and Eastman himself. I do love something about the panda being a martial arts master roaming the asia continent (for whatever unknown purpose) and helping people a long the way. 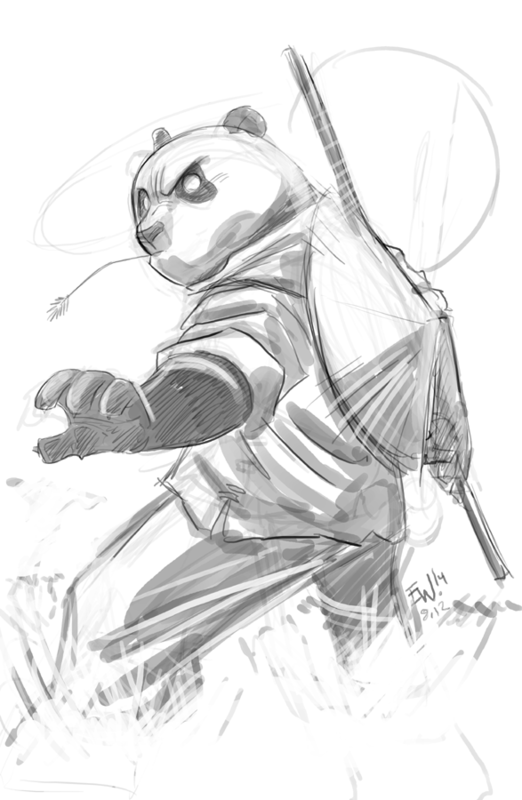 Maybe a new show is called for, not about Po but about a mystical warrior stature of a man look of a panda, a nomad helping people town to town on a path of revenge and redemption - Panda: The Legend Continues or something LOL - naw who knows. But yeah, I like it in a more serious style and more in line with old school kungfu movies and such. Could be awesome. Thats all that really ended up coming out here. Alright! Now that the art partition has taken the lead in this ol' noggin and the hand is warmed up - time to rock and roll on commissions rest of the day! 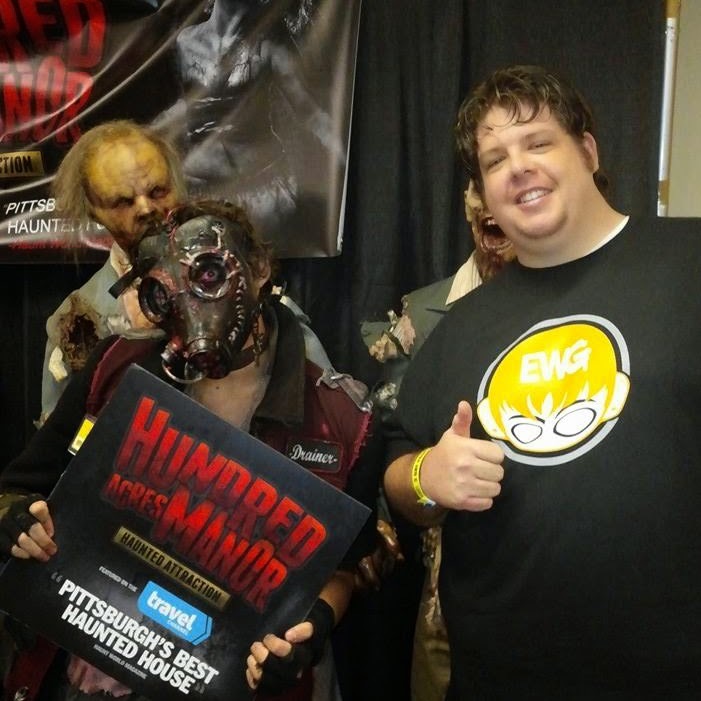 Steel City Con was my first real con since I was a kid. I had gone to it with my dad and still have the free comic I got there of Image Comics 'Patriot' in all its Rob Liefield extremeness. 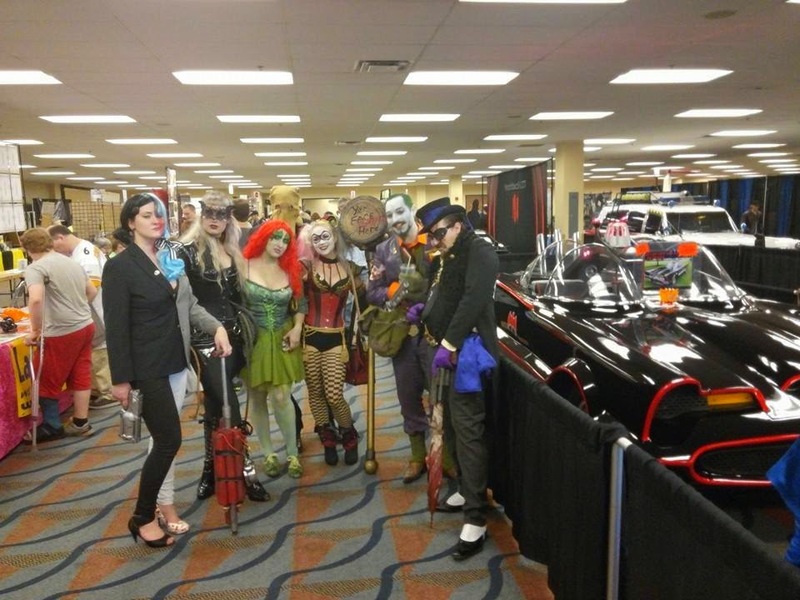 But in general haven't made it to a con till this year. Well it served mainly as a business trip and also then ended up being a nice surprise gift for the mother in law! Day one was me, my wife Kristina and sister. 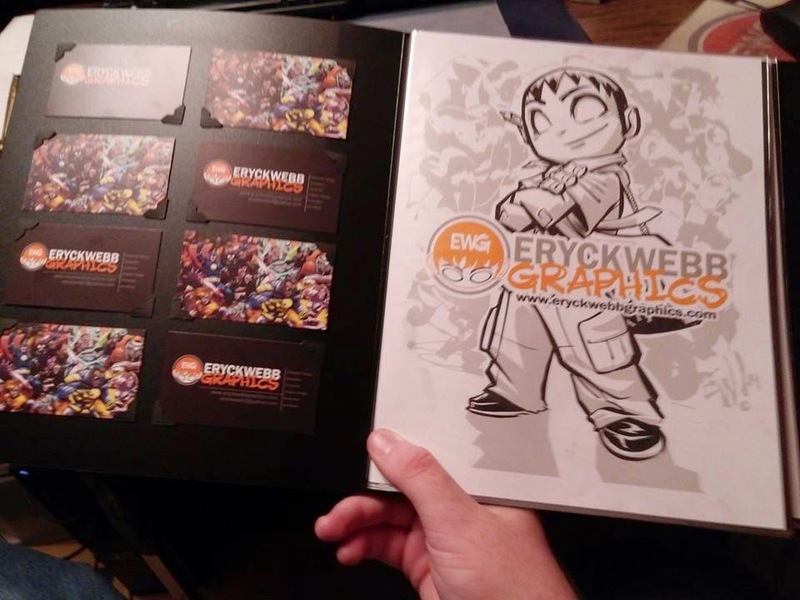 I had my EWG shirt on, nice pants and shoes and had my portfolio with best works from the entire range of projects I do as well as a handful of business cards mounted inside the portfolio. I took a nice portfolio, and a load of business cards - showed it to some folks, checked out other folks - all in all potential business has been made and my brand was exposed to the hundreds if not thousands of people there just by walking around with the logo on my shirt. Can't complain. Perhaps next year, a table? 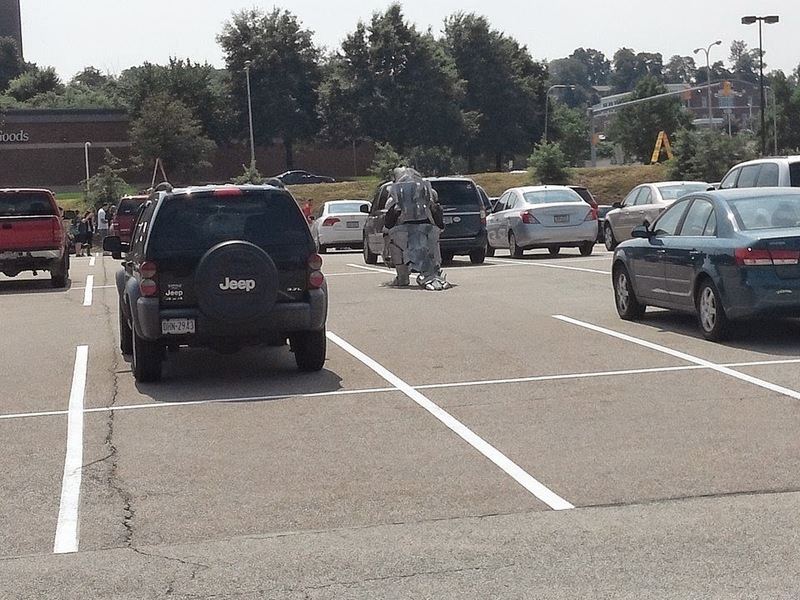 I gave out several, had a person or two check out my work and nobody could miss the big guy with the big EWG logo on front and back in bright orange walking around. So I'm sure, in all the exposure was decent. The Artist Alley was OK, I recognized some artists I met before the con on Deviant Art who said they would be there, and saw a lot of folks who were selling original artwork and prints very similar to what I do. I wasn't impressed with the dark area they had artist alley in and how it was out of the main flow of traffic. I was more impressed with the 2 or 3 artists who were setup in the main flow of toys and collectibles out front. That is most likely where I will try to be if I get a table at a future con. Anyways in all it was an amazing experience, surreal really, and I got to really just dwell amongst my geeky peers and enjoy ninja turtles, transformers, supernatural, marvel and dc comics and other toys prints and merchandise and it wasn't weird. Everyone there was into it too. Some vendors were pushy 'on sale now! get it while its hot' some were 'hey you guys having a good time? its been crazy right?' and others were just hiding behind their tables and not socializing hardly at all. But what WAS happening, was our attention was pulled in every direction possible and there was soooo much to take in, and there's never enough time to look through everything or never enough money to really buy everything you want. Was very cool. So Friday I went and took a business-oriented assessment of the whole con. I do like that it was less busy on Friday we even were able to park near the front. 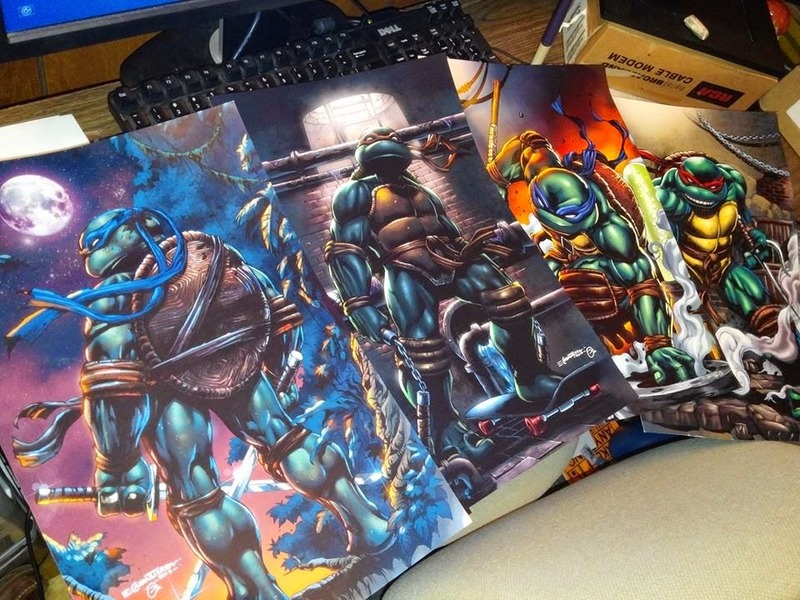 I came home with four solid turtles posters I got from a fellow who was representing many artists. I inquired on how he goes about finding the artists, he was a bit standoffish but willing to look at my portfolio and i gave him a card. I didn't know the artist that did these three prints but they were a great deal at the con so I grabbed all four brothers. I didn't really know who the artist was (can see his signature though) but I knew I had to have them! Soon as I get a new proper studio will be framing and hanging these bad boys! My reasons for drawing, period! Friday was a day to get the lay of the land check everything out and get used to it while it was relatively unchaotic, and Saturday was a whole nother story. 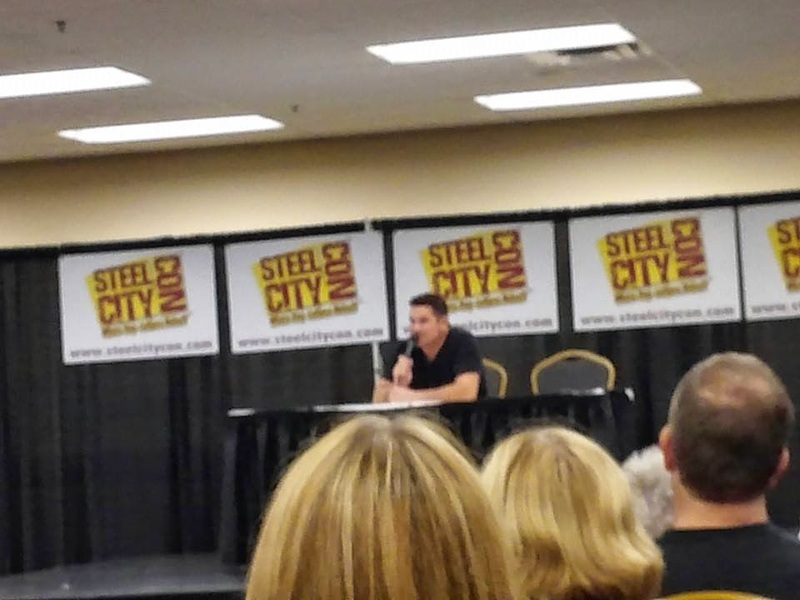 Saturday we got there more towards noon as we were mainly there to enjoy the celebrities that were going to be doing Q&A panels all day and Dean Cain was there Saturday. The chance to meet Dean cain really helped my mother in law get through her last week or two of oncology treatments and it made her year heck, her decade when she got to meet him, get a bunch of hugs, hold hands and he even gave her a peck on the cheek she'll never forget. Kristina got hugs and meeting him time too and we have photos of them both meeting him we'll cherish forever. Levar Burton was the best Q&A panel, second would be Penny Marshall - that's a lady who is hilarious and she doesn't even try, that's just her. Then Dean Cain would be my third favorite panel he is just so genuine open and will go into stories to answer questions that are just fun to listen to. Did you know he beat out Kevin Sorbo for the role of Superman on Lois and Clark? Also I will now have to go look up Airplane vs Volcano just to see a good ol' B movie with him in it haha. Got to shake hands with Dean Cain when we ran into him after the Q&A checking out the adam-west era batmobile, and bumped fists with levar burton and talked about his super successful kickstarter campaign to revive reading rainbow. was all surreal. 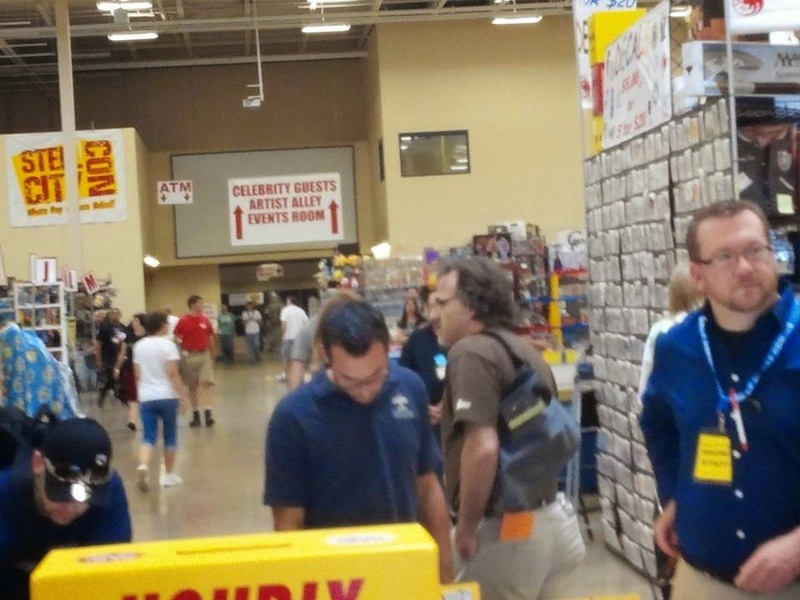 It was a whole lot more busy Saturday, but it was better that way. 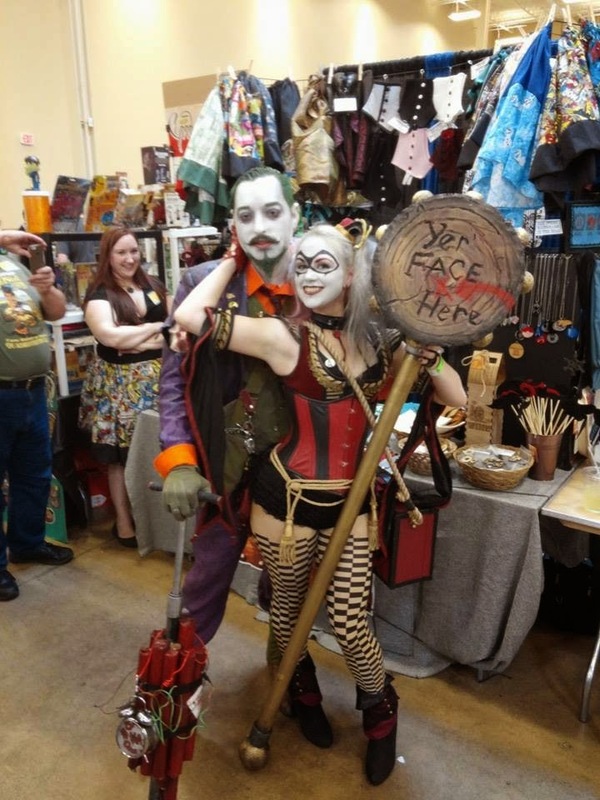 Vendors had better stuff out, there were tons more costumes walking around and it was all 10x more awesome. I thought the extra crowd would be nuts but it was MORE IMMERSIVE. We knew we weren't coming back Sunday, though the costume contests would have been awesome, 2 days was all we could take this time around. I got two cool army of darkness comics, one 'Ash saves obama' just cracked me up so i got it - was a dollar, and the other is the first issue of 'Ashes To Ashes', a direct sequel to Army of Darkness, which I'm really digging and kicking myself for not getting the other 3 while i was there. Plus it has the awesome cover by the legend himself JScott Campbell - I picked up two graphic novels which woulda easily been 20 each or so normally but were 5 dollars each of Skottie Young's Oz series.... love his work follow him on deviant art regularly and am very excited to study his work in these books. Also got 40% off two new copic marker packs. The girl running the table for the discount art store was by far the most talented at the con, she did great color sketches and cards of How To Train Your Dragon, My Little Pony's and more. I was very impressed. I also broke the seal on my Japanese mech model/kit virginity. I got my first one at this cool booth that featured tons of imported model kits and toys. I've already got a leg and arm built and cant wait to do the rest. Who knows maybe after I get it all put together I'll take it apart and color it EWG colors or something - but it was a small-doable model and the design stood out to me and was the cheapest so I got it! Very glad I did. The comics were a dollar each, the mech kit only 20, and the oz novels 5 bucks each. The copics 40% off - all unheard of! The con was awesome, and I'm seriously contemplating going to either the December one or the April one. I might make a habit of going to the Summer one once a year at least, cause it seems to be the best time to go! 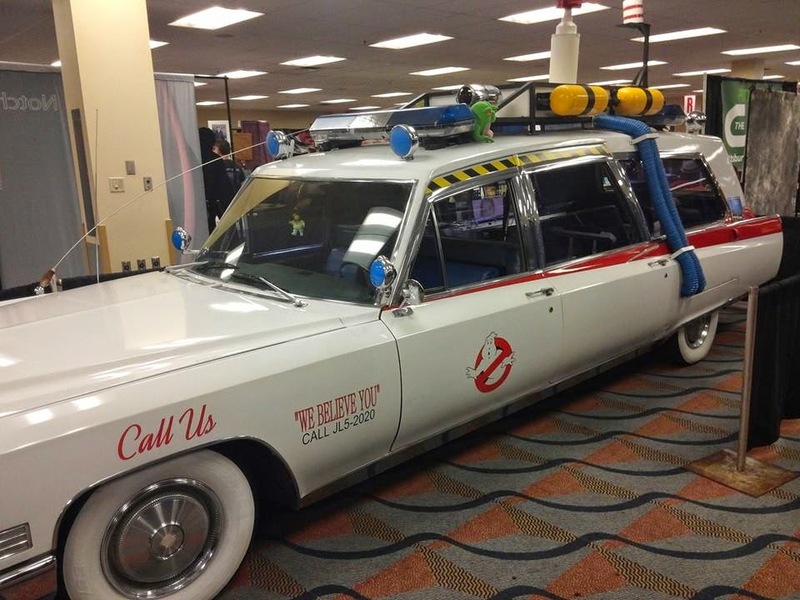 There were ads for a Cincinnati con soon too maybe will check that out eventually. This was nice cause we could drive there from where we live in under 2 hours. The cost could stack up easily trying to fly out be in a hotel and bla bla bla. Not ready to do that yet. Maybe after Kristina and I get setup with our new house then we can save up for that. Below is a summary of the con in pictures! Most of these were taken on Friday, the celebrities were taken on Saturday but I did not get any pics that reflected the massive crowds and awesomeness of Saturday. 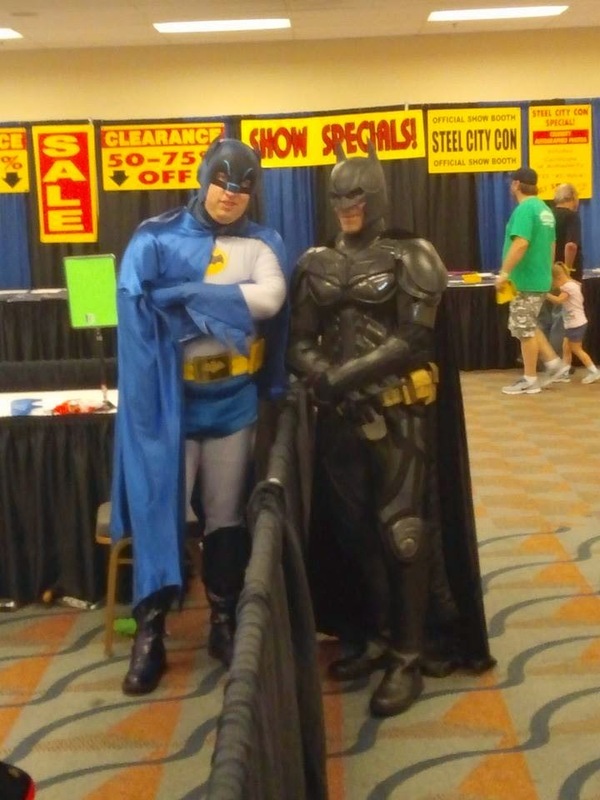 Yes I can definitely recommend the Steel City Con, its a big event and super awesome. And yes EWG will definitely be settling in with a table there sometime in the foreseeable future! 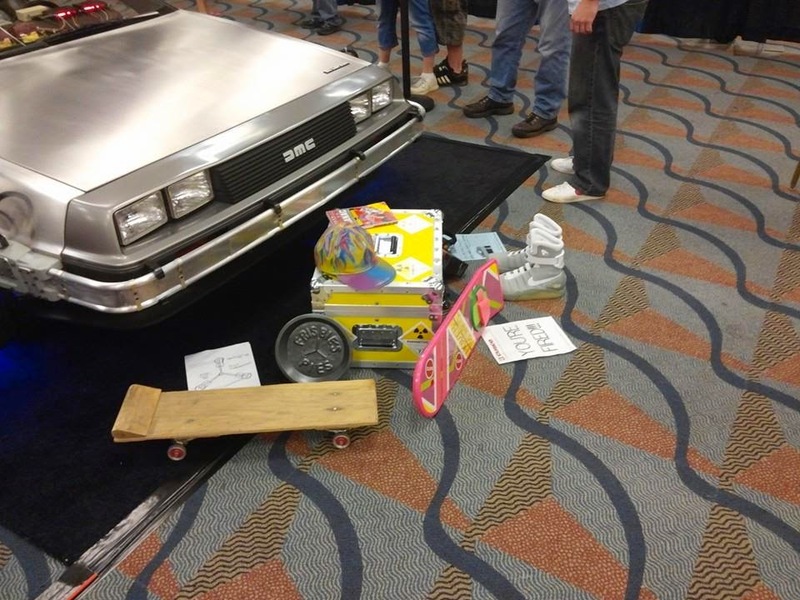 Deloreon and other Movie props! 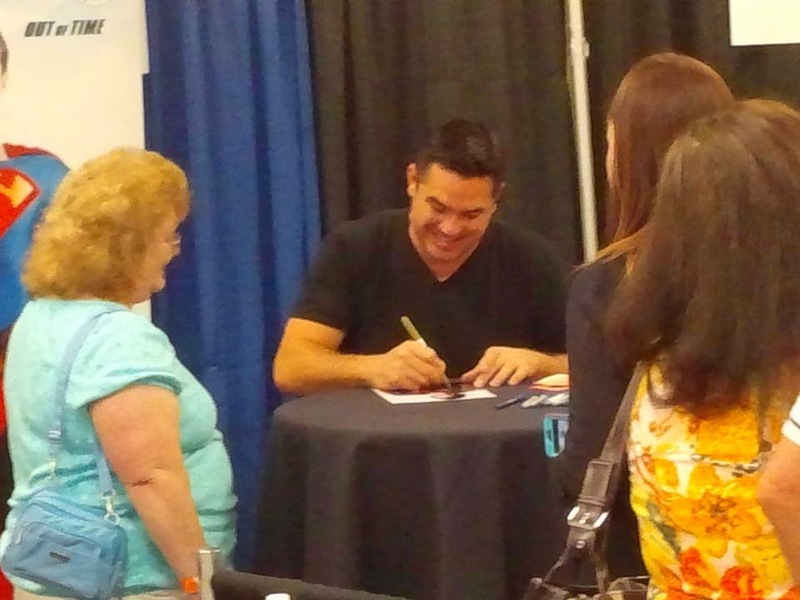 Dean Cain was great to see/ meet, my wife and ma in law loved him! They both got hugs and I got a handshake after his Q&A! 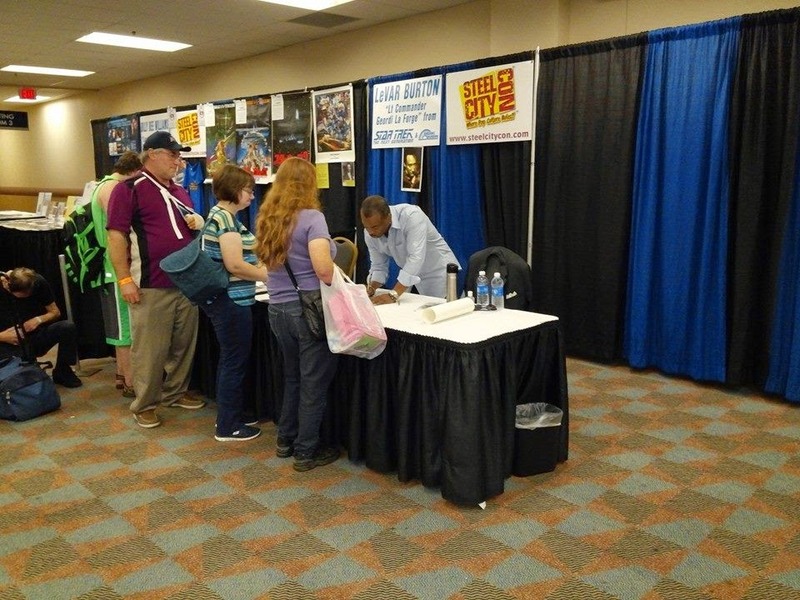 Levar Burton - we loved his Q&A and met him/ fist bumped him after the show - was such a nice guy! 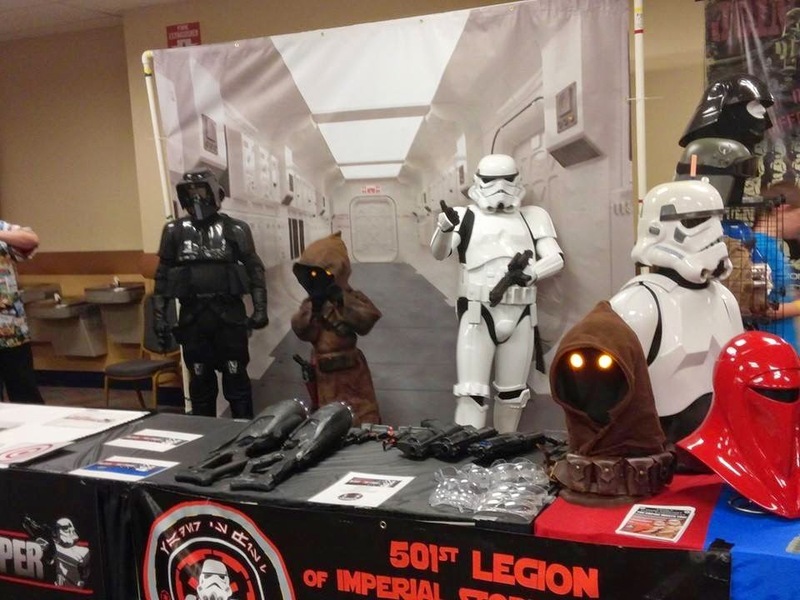 There was an awesome legion of stormtroopers jawas and other starwars characters, these guys particularly were raising money for childrens cancer - i salute them! 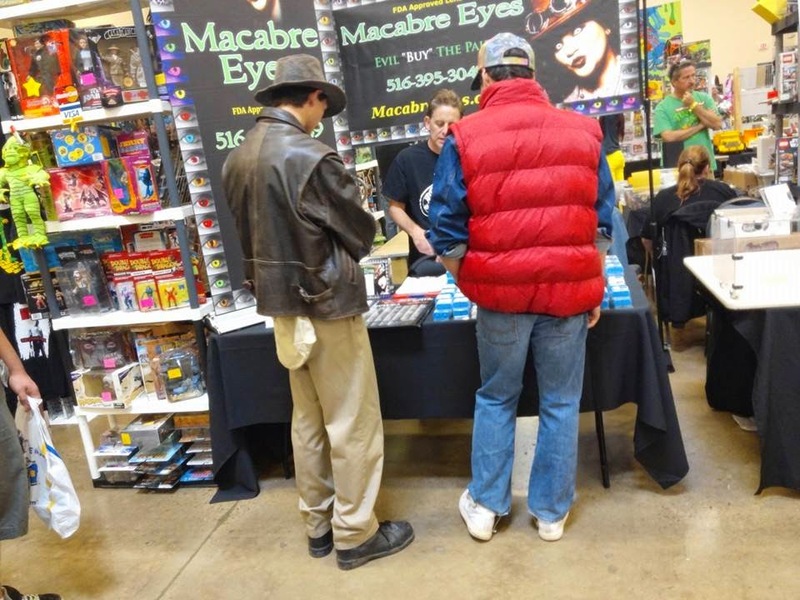 I saw pals Indiana Jones and Marty McFly all over the con - they seemed to really dig it! 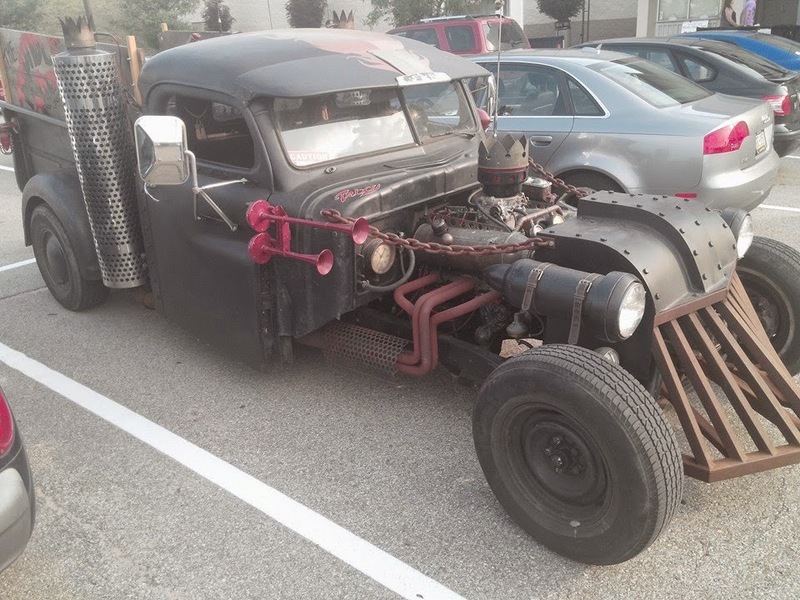 Day 1 this beastie was parked out front of the convention, I've always loved me rat rods but this was the first I got to see, touch and smell - it was amaaaazing. And highlight of the moment, Kristina actually said 'I really like that cow catcher definitely have to have one of those if we were to have one of these' - massive points won over here. My sister's dream came true when she got to sit in and get pictures with KITT from KnightRider - and a picture of her with the Hoff - but she cared more bout the car. 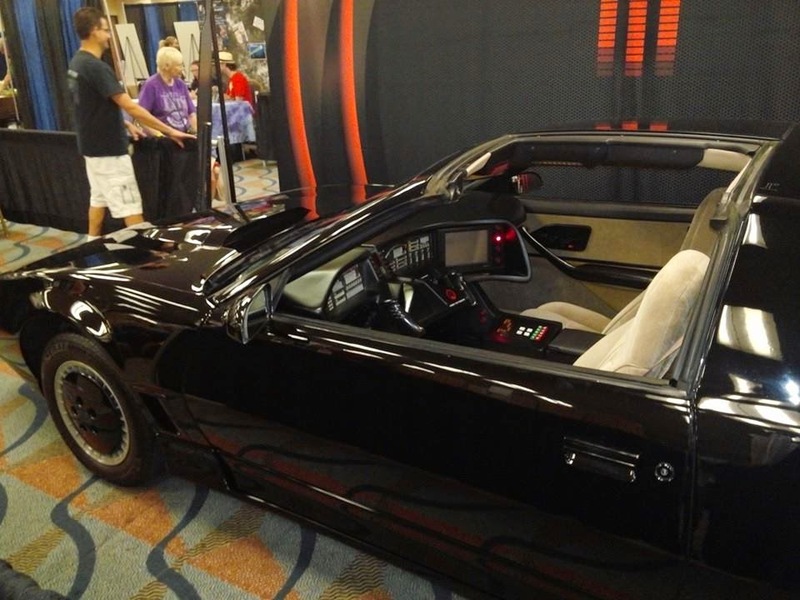 When she sat in it and said 'KITT Activeate' it all lit up and everything just like the show. Her face was priceless. No show is complete without the batmans. 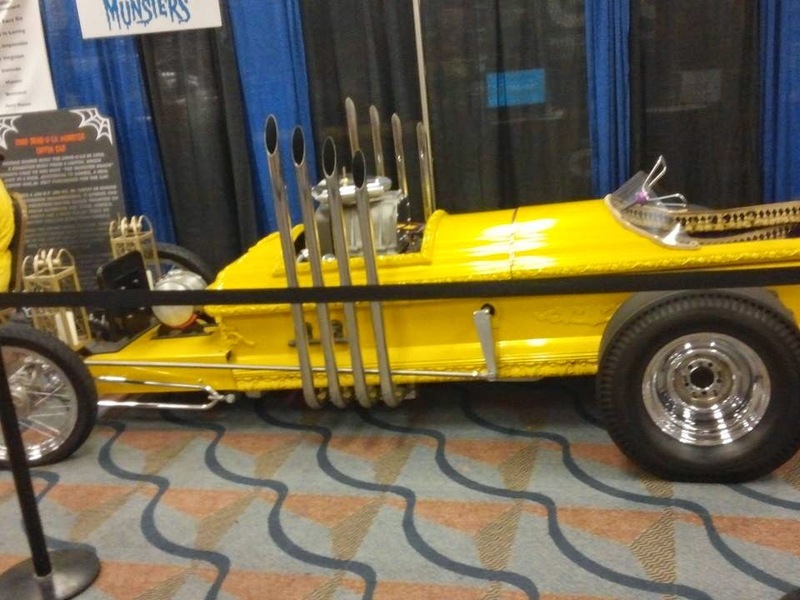 I saw 70s bats and bale bats walking around the show often! My sister got a shot of Iron Man/Tony Stark who was playing the role perfectly with and without his visor down but I never did see him! The show was insane and awesome and will definitely have to go back. 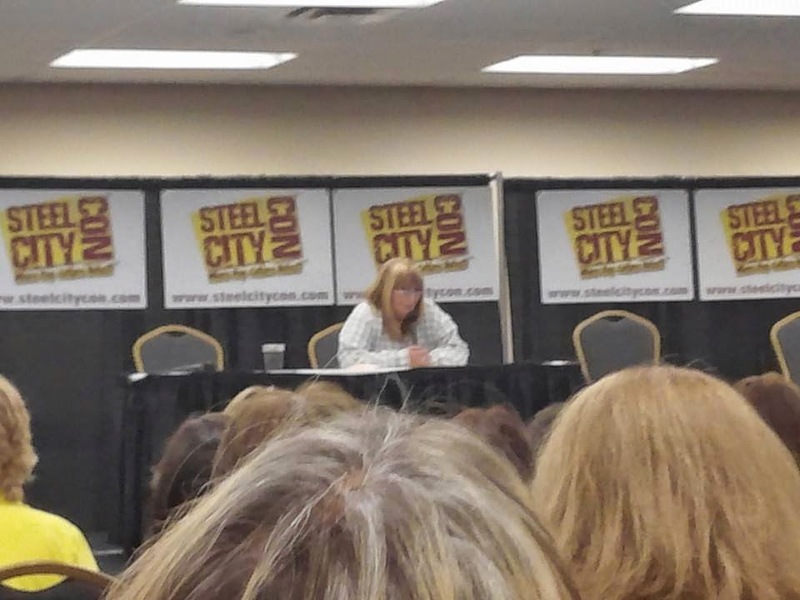 Thanks for having us Steel City Con! 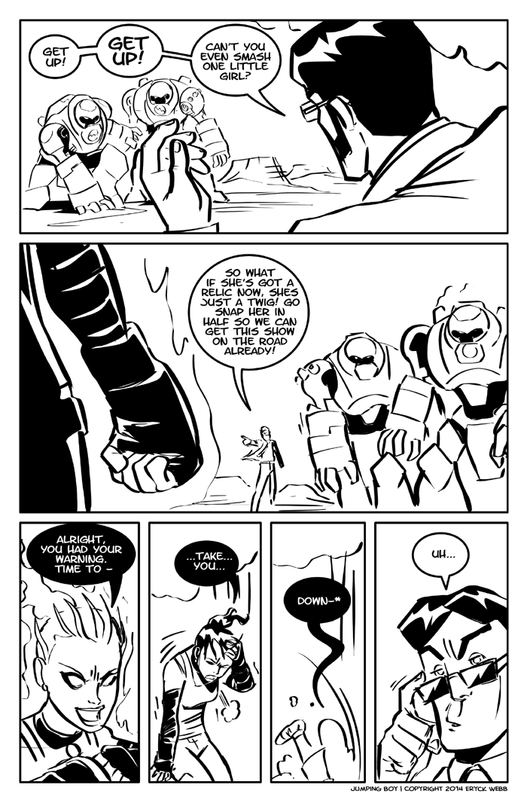 TnC Webcomic Year 2 Begins Today!